Overall, 69 percent of Americans think gun laws in the United States should be made stricter. That’s up from 61 percent who said the same in October of 2016 and 55 percent when the AP first asked the question in October of 2013. Overall, 90 percent of Democrats, 54 percent of gun owners and 50 percent of Republicans now favor stricter gun control laws. 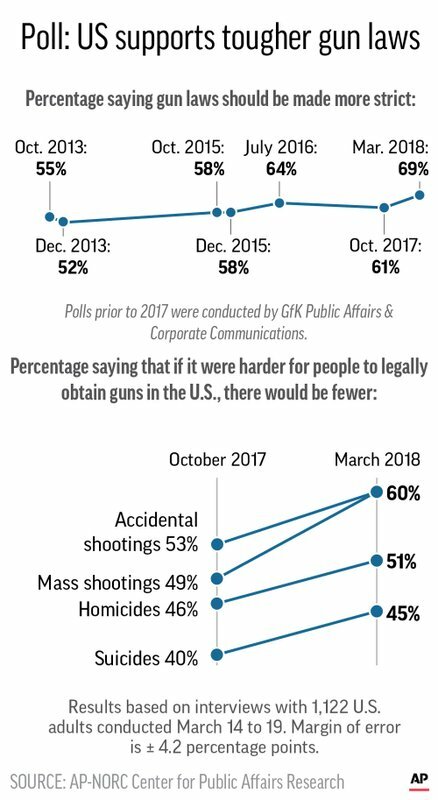 Sixty percent believe that making it harder to legally obtain a gun would result in fewer mass shootings; just 49 percent said the same in the 2016 poll. Graphic shows results of AP-NORC Center poll on gun violence. But when asked about specific gun control prescriptions, the 82-year-old retired nurse, who said she owns a rifle and a .44 Magnum, said she favored stronger background checks and limits on the number of bullets allowed in a gun magazine. She also opposes President Donald Trump’s plan to give guns to trained teachers. The poll shows that McIntyre is not alone. More than 8 in 10 Americans favor a federal law preventing mentally ill people from purchasing guns, along with a federal law expanding background check requirements to include gun shows and private sales. Nearly 8 in 10 favor allowing courts to prevent people from owning guns if considered a danger to themselves or others, even if they have not been convicted of a crime. And 7 in 10 favor a nationwide ban on devices known as “bump stocks” that allow semi-automatic guns to function like automatic guns. Nearly 6 in 10 favor a nationwide ban on AR-15-style rifles. “They should take them off the market. Too much power right there,” 25-year-old Sedrick Clark, of St. Louis Missouri, said of AR-15s. Clark, a self-described Republican, said he recently purchased a handgun for protection. But he said he’d support police efforts to go door-to-door to confiscate “dirty guns” from convicted felons and others who shouldn’t have them. “I know Trump would do it,” Clark said, praising the Republican president. Americans have mixed views on whether they expect any elected leaders to enact tougher gun control laws in the next year. The Florida legislature passed a law earlier in the month to raise the minimum age to purchase a firearm to 21. The law also extended the waiting period to three days, banned “bump stocks,” funded more school police officers and mental health services, and allowed certain staff members to carry guns in schools. Congress, however, has yet to adopt new gun control measures that would apply to the rest of the country. Just over half of Americans — 51 percent — expect elected officials to tighten gun laws, while 42 percent expect no changes; another 6 percent expect gun laws to be made less strict. Nearly two-thirds of Republicans, but less than half of Democrats, predict gun laws will be made stricter. Democrat Cody Campbell, a 42-year-old IT worker from Atlanta, suggested that the financial impact of the gun industry would prevent meaningful change. “Here in the U.S., it’s all about the money, and guns are a big part of how we make money,” said Campbell, a gun owner who supports stronger gun control. In Florida, not far from where a 19-year-old gunman killed 17 people and wounded 17 others last month, 50-year-old John Karnosh said he’s favored stricter gun control measures since the 1999 school shooting in Colorado’s Columbine High School that left 15 dead.